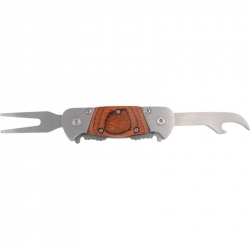 Features pakkawood handle, stainless steel bolster, golf divot tool, and beverage opener. Measures 7-1/4' open, 3-1/4' closed. Limited lifetime warranty. Gift Boxed. Sharpen your putting skills anywhere, anytime! With the Wood Putter by Maxam(TM) you can practice at the office, in your hotel room, living room, or outside in the yard. Handcrafted of cherry wood, this putting set includes a wooden golf hole target, 2 golf balls, and a wood-shafted putter with metal club head. 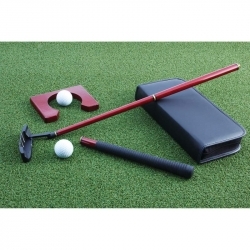 The putter unscrews into 3 parts to fit snugly in an easy-to-carry 12-1/2' x 5-3/4' x 2' vinyl case. Compact and easy to carry, the Maxam(TM) Wood Putter is an ideal travel or office companion. Gift boxed.